Update (2/2/19): It’s been about a month since this contest ended and about a dozen people have added their book reviews to Amazon. I’m grateful for those responses, but before I go about shipping books around the world, I’d like to see if a few more can go up. To sweeten the pot, I found an extra copy of the Big Book of Dashboards in another bookcase, so I’m adding that as a fifth prize. I came across several extra books when I was cleaning up my office a few weeks ago. I’m not sure how I got them, but there they are, taking up room in what has become an overcrowded bookshelf. I found two extra copies of Cole Nussbaumer Knaflic’s Storytelling with Data and Andy Kirk’s Data Visualisation: A Handbook for Data Driven Design, an extra copy of Naomi Robbins’ Creating More Effective Charts, and, somewhat unbelievably, an extra copy of John W. Tukey’s Exploratory Data Analysis. 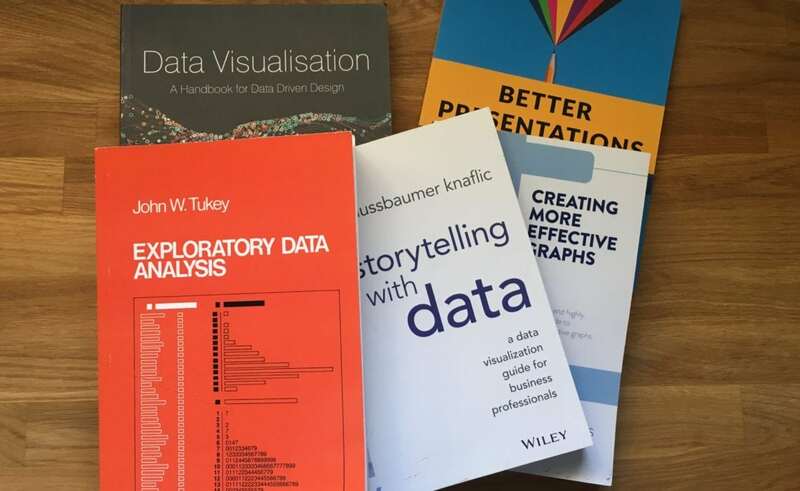 These are all great books, ones that have helped shape my thinking about how to best communicate data and create visualizations. And I’m going to give them away. I’ll also throw in a copy of my own book, so that you can give it to someone you think can use it. Plus, I’ll include a copy of my desktop Graphic Continuum sheet (a $13 value). -Post your review to Amazon and let me know you posted it, either by email or on Twitter. -The lottery will be held on New Years’ Day. -This contest is without replacement—you can only win once. -If there are fewer than 40 reviews, no one wins. In other words, if only four people post reviews, they don’t each win a set of books. It’s got to be (at least) 40 reviews. So write your review and encourage your friends and colleagues who’ve used the book to write a review. I hear lots of great stories about how my book has helped people do a better job communicating their work. So if my book as helped you elevate your skills, I’m asking you to please share the love by sharing those success stories. That’s it. 40+ reviews. Random drawing. Lots of great books. For free. New Year’s Day.